These are some of the final steps to completing your project. Some of these can be optional if you don't care about LED lights for power indication, or a wired USB port, but the shoulder buttons and closing up the case are a must follow steps. These LED lights actually have three different light colors you can use, but for my use case I'm just using it to indicate when I'm charging the battery and when the battery is getting low. Go ahead and wire the LED just like I did below. The case may look a little different as I added a lip for the LED light to rest after I took these photos. When wiring the USB, make sure you wire the correct pins on the USB header you get with your powerboost 1000c to the correct port locations on the Pi Zero. You'll use a little wire to accomplish this, but should be a pretty simple wiring job. Cross reference which port on your USB header coordinates with 5V and GND by looking at how it goes into your Powerboost and you'll get it. Don't wire this wrong, as you risk overloading your data ports and possibly damaging your Pi Zero. This is also pretty simple. Go ahead and place the rectangular speaker in the speaker holder and solder the speaker wires to the speaker wire location on the PCB. Simple enough! Should also be a pretty simple step! 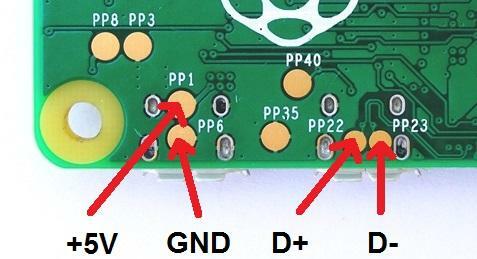 Go ahead and solder the two prongs for the shoulder buttons directly the pinouts you soldered to the PCB. Go ahead and clip the shoulder buttons down for length, and they should be tight in their holder locations. The actual 3D printed shoulder button will be kept in place by putting a straightened and trimmed paper clip that is long enough to go through the hole on the button and rest in the slots on the front and back cases. Go ahead and make sure all your wires are in the correct place so they don't get pinched or cut. You'll want to use a bit of masking tape to keep everything in place. Go ahead and compress the back case tightly to the front case and slowly screw each screw into the back case one at a time. Because of the threaded female inserts, this should make the screwing the case together a breeze! Test all your buttons. If they are tight, you may want to unscrew and go ahead and make some adjustments to the button height (compress the 8mm x 8mm button to the PCB further). You may also have to adjust the start/select buttons as well. The good news is that I've made the PCB with holes so you can remove the whole assembly to get to those buttons if necessary!